You might wonder how on earth a Neanderthal can possibly be linked to the Tallahassee real estate market, but I have recently found the link. Long term readers know the Tallahassee Real Estate Blog likes to focus on charts, graphs, and analysis of the Tallahassee housing market, but we occasionally stray "off topic" when we find something that could be interesting to our readers. Today I want to share a neat experience (which I am still enjoying) from when I recently discovered the benefits of doing a DNA test. Have you ever been curious about what your DNA says about you? Perhaps you want to find out if your children (or you) are at risk for inherited conditions. Could be you want to explore genetic health risks so you can manage your future. Or maybe like me, you are curious about where your family has been for the past 50,000 years. I happened to see a commercial for 23andMe.com, a personal DNA testing company. You pay $100, they send you a kit (think small container that you spit in for a minute or two), and then you simply return it in the box that they provide. It takes a few weeks, and then they send you a link to a website that allows you to get a lot of information about "you." I was not motivated about the possibility of improving my health with DNA, I was just really curious to see what I could find. The following is a video though of somebody who received a significant health benefit for herself and her children after having done the test. Are You A Neanderthal (Too)? OK, so back to the point about Neanderthals. 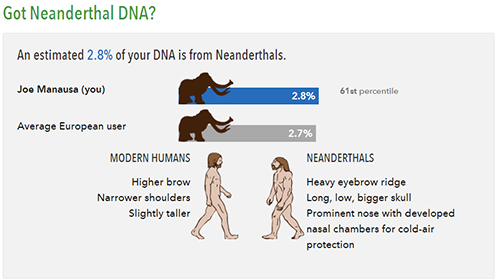 The study showed that 2.8% of my DNA is from Neanderthals. Amazing. Of course, that begs the question ... do you get the majority of your Tallahassee real estate reports from a Neanderthal? If you have an extra 100 bucks to spare, I encourage you to check out your DNA. Your privacy is protected, and you can opt to share your results for the purpose of comparing with other test subjects. I will continue to review my results and see what else I can uncover about my roots. p.s. If you are more than 2.8% Neanderthal, come back and post a comment below letting us know. Our kind has to take care of eachother. It's The Craziest Thing I Ever Heard, Are You Guilty Of This Too?